The lotus is a perennial flowering plant native to the Middle East, Asia, Australia and New Guinea. The plant is a water plant, and is found in nature in bodies of fresh water. The plant is also known by the names sacred lotus, Indian lotus, Chinese water lily and Egyptian bean. The botanical name of the lotus is Nelumbo nucifera; the plant belongs to the family Nelumbonaceae. Nelubo is the only genus in the Nelumbonaceae family. The seeds of the lotus plant are dark brown and hard. Seed shapes include round and oval, but most are crescent-shaped, resembling small brown bananas. According to plantcultures.org, lotus seeds are "the oldest viable seeds ever recorded," germinating after 1300 years. The leaves are round, with gathered edges. The leaves are attached to long stalks, and they float atop the water's surface. Lotus flowers are large, with several layers comprised of many petals. Most specimens are pink, white or bi-colored pink and white. The root system of the plant is a rhizome. A rhizome is a gnarled, knotty, woody growth that is akin to the bulb of a garden lily. The many stems of the lotus plant grow out of the rhizome. The rhizome anchors itself into the muddy floor of ponds, lagoons and marshes. The lotus needs warm temperatures in order to grow and produce blossoms. The plant grows only in fresh water with muddy floors. It will not grow in salt water or in ponds with sandy floors. Lotus plants require full sun exposure, with at least eight hours of sunlight per day. The plant will produce stems and leaves in filtered light but will not produce blossoms. 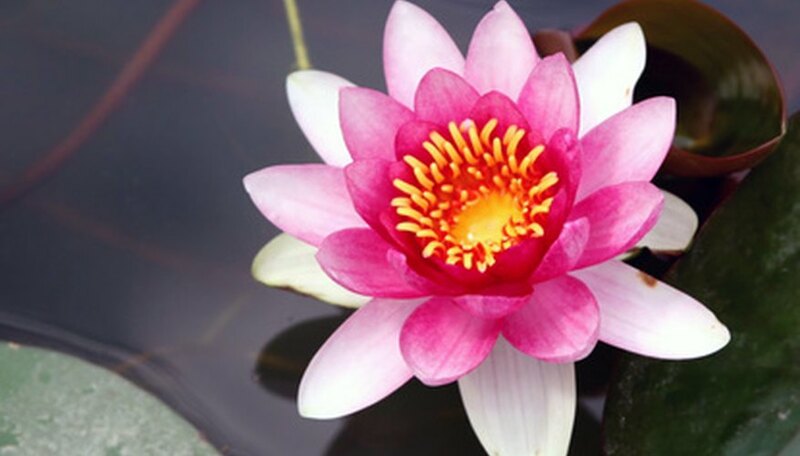 Lotus plants can be grown in home gardens in man-made ponds or in containers. In containers, pond conditions are simulated with mud, pebbles and deep water. Margaret Simpson--a professor at Sweet Briar college in Virginia--successfully grew several lotus plants after germinating the seeds and transplanting the plants into successively larger containers. The lotus plant and flower are referred to in Hindu and Buddhist texts and lore. Laxmi--a goddess in the Hindu religion--is also known by the names Padma, Kamia and Kamalasana, which are all names for the lotus flower. According to lore, Laxmi was born from her father Vishnu's forehead. Vishnu, Ganesha, Shiva and other Hindu deities are often depicted holding lotus blossoms. In the Buddhist religion, the lotus represents the mind that is on the path to enlightenment. The growth of the flower from mud, through muddy water, to the clean surface represents the mind's path from murkiness to clarity. The open lotus flower represents enlightenment. The closed lotus blossom represents the potential for enlightenment. The rhizome, stem and flower of the lotus are all edible. They are most often used in soups and stews. Even the plant's seed is used in Indian dishes. Dr. Subhuti Dharmananda, Ph.D., Director, Institute for Traditional Medicine, Portland, Oregon, says that the lotus plant has carbohydrates, protein and very little fat. The plant contains sodium, potassium, calcium and phosphorus.